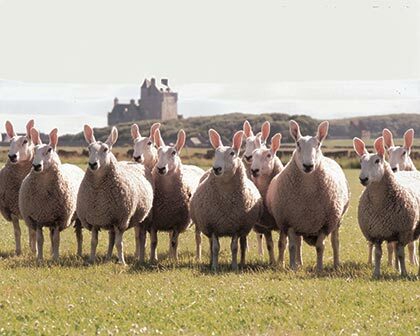 The story of Doulton Border Leicesters. Our story begins way back in 1997 when I bought a couple of Border Leicester ewe lambs from Lanark Auction Mart. I knew very little about sheep, even less about Border Leicesters at that time. All I knew was that. after a chance encounter with a huge ram, at East of England Show, I was hooked. I loved his amazing head, so proud, with the big roman nose. I loved the way he showed himself off, even while just standing beside his owner, who was sitting on a bench. I loved his dignity. Two months later I took delivery of the 2 ewe lambs which the ram’s owner bought for me at Lanark. They were so wild, climbing up the walls and flinging themselves around! I called them Minnie and Martha after Coronation Street characters and it din’t take too long before we became friends. Each of them had wonderful personalities and were so beautiful. They also had wonderful, long stapled, crimped, semi lustrous fleeces. None of my sheep ever go for slaughter. I could not do it to them. I prefer to say that they are born to grow old, which is what happens here. The years went on and my two lambs turned gradually into 300 sheep. I learned how to show, to appreciate good fleeces and to breed for fleeces. I started to sell their beautiful fleeces to spinners and eventually got my first batch of handpicked fleeces processed into a beautiful yarn. We are now on our 3rd year of producing our fabulous Doulton Border Leicester yarn. All with full provenance. The Border Leicester changed my life completely. For the better I believe.